Limbaugh criticized RNC Chairman Michael Steele for his recent comments. (CNN) - Talk radio host Rush Limbaugh fired back at Republican National Committee Chairman Michael Steele Monday, suggesting on his radio show the GOP leader appears to be supporting President Obama and House Speaker Nancy Pelosi. "Why do you claim to lead the Republican Party when you seem obsessed with seeing to it President Obama succeeds?" Limbaugh addressed Steele. "I frankly am stunned that the chairman of the Republican National Committee endorses such an agenda. 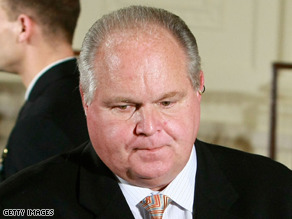 I have to conclude that he does because he attacks me for wanting it to fail," said Limbaugh. Late last week, Steele told CNN's D.L. Hughley that Limbaugh is an "entertainer" whose comments are "ugly." Also on his radio program Monday, Limbaugh said Steele is being used by the "liberal media." "Michael Steele has been around long enough to know that the liberal media will use him by twisting what I say or what others say," he said. "He took the bait, he bit down hard on the bait, he launched an attack on me, even though the premise of what was said to him was false." OMG ~ He's an enormous fat pig! Sorry, that not nice. Pigs can't help it if they look like Rush. I'd rather be a screwed conservative than a lib depending on the government to constantly bail me out for bad decisions. Grow up. Is there anyone out there that really believes that Rush Limbaugh knows anything. What has he ever done except shoot off his big mouth. this is a great story, please keep pushing..i love seeing the Republicans self destruct!